Effective massage with seeking out “Muscle Knots” (where muscles are tight) is you can expect the most therapeutic effect by stimulation. Trigger Point is a trigger causes pain. Muscle neck, shoulder, back, hip, and buttocks can be hard stiffness in tension strongly in rope-like when poor circulation and fatigue last. It is said “Taut Band” in technical terms. Such “Pain symptoms caused by muscle tension strong” is said “Myofascial pain syndrome：MPS” in medical terms. 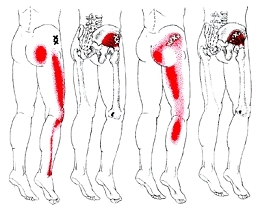 “Trigger point” has a feature that causes pain, numbness and languor not only around it but also in distant parts. For example, stiff neck or shoulder causes headache. As show in Figure A below, stiff neck or shoulder becomes “Triggerpoint,” and it can be referred paint causes headache. X-mark is a trigger point, and a red area is the result of pain (referred pain). In such cases, you may be headache that did not go away to drink medicine, resulting in easily solved by loosening the stiffness of the neck and shoulders. We treat a trigger point by manipulation that loosens tense muscles, improve blood circulation and relieve pain. It loosens tense muscles, relieves pain and lasts therapeutic effect. It also relaxes tense muscles by resistance movement and recovers the connection of nerves and muscles (neuromuscular function). It loosens a stiff joint by manipulation and recovers normal movement of the joint (Intra-articular movements). We may add low-frequency therapy (electric treatment) depending on symptoms. As a result of these treatments, paint and neuralgia will improve. We effectively recommend these treatments while watching each patient’s symptoms and response to treatments. Health insurance does not cover the trigger point treatments.